In 1932 the Carnegie Foundation gave a grant to a Professor at the University of Washington to develop the design for the ultimate keyboard. They had good reason to try – as study after study showed that the “QWERTY keyboard” (as it was commonly known) had a terribly inefficient design ever since it was patented back in 1878. The QWERTY keyboard was originally meant to offer a solution to the problem of keys sticking together on a typewriter by slowing typing down. The most commonly used letter combinations were placed further apart. The layout of the letters followed no intuitive logic. As a result, it worked for a short period – and solved the problem of sticking keys with an intentionally illogical and inefficient design. Over time, however, the typewriter technology just got better and it caused Professor August Dvorak to think that in 1932 that the world needed a better design. So with his grant, he invented the DVORAK keyboard. It had a much more efficient design that placed the most commonly used letters in the middle row within easy access. You could now type the 400 most common words in the English language just with the middle row (you could only do 100 on the old QWERTY). The fastest typist in the world, Barbara Blackburn even set a world record of 212 words per minute on a DVORAK keyboard. Yet we all know how this story ended – Dvorak lost the fight against QWERTY. 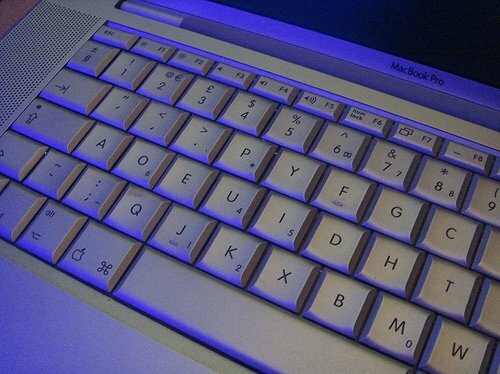 The DVORAK keyboard design was never adopted on a mainstream, because nearly anyone who had to type had already learned how to use the inefficient system of the QWERTY keyboard at fast speeds and was unwilling to learn a new system. It was faster, easier and better to use the inefficient old solution than the newer, more efficient and clearly superior alternative. Years later, I still use this example as a powerful reminder to any entrepreneur that sometimes having the best or most efficient solution isn’t the most important thing. There are old habits to break and biases to unlearn. Getting someone to change a learned behavior on anything from choosing one particular vendor or buying a certain type of product requires understanding what you are really up against. Professor August Dvorak underestimated how much affinity people had for their inefficiently designed QWERTY keyboard. What kind of existing affinity that your customers have are you underestimating? Answering this question can be the first step in avoiding failure and making sure you are not fighting a hopeless cause.